We’ve got some great things coming up later this month and we’re grateful to be able to share them with you! 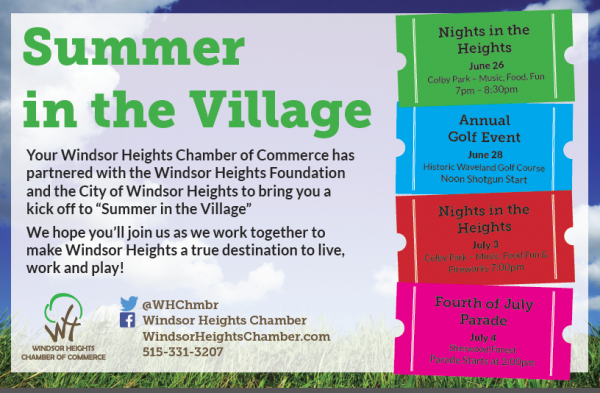 Your Windsor Heights Chamber of Commerce the Windsor Heights Foundation and the City of Windsor Heights have teamed up to bring you some great events that help stamp our community as a great place to live, work and play. Each year your Chamber of Commerce holds two major fund raising activities…so we can do what we do in Windsor Heights. This year we’ll return to the Historic Waveland Golf Course on Thursday, 28 June for a best ball golf event. Anyone can join us. We’ll have food from Blizzards from the Windsor Heights Dairy Queen (thank you Nate!) to the famous (cooked on site) Waveland Pizza, beverages, networking, prizes, golf photos and loads of fun. Our corporate sponsor is once again Colby Interests and a number of companies have joined them including Bolton & Menk, 3-E, Insight on Business the News Hour, Shyft Collective, the City of Windsor Heights, the Windsor Heights HyVee, and Koester Development. We want you to join us! To register, just click this link! Questions? Call us at 515-331-3207. Tuesday night the 3rd we’re back with Nights in the Heights! The band is Abby Normal and yes, we’ll have food trucks, beverages and FIREWORKS! You’ve got to come and be part of the party! We start gathering at 6pm and Abby Normal hits the stage at 7pm. There was talk around town that this was not going to happen. We couldn’t let that happen so the your Windsor Heights Chamber and the City of Windsor Heights are coming together to put on the annual event. For details of the kids parade, the pooch parade, to volunteer and to get registered just head to Windsor Heights 4th of July Parade page. Our thanks to Lauren Campbell of Campbell Photography for taking the lead on this event! And we have a new member of your Windsor Heights Board of Directors! We had a vacancy when Joy Peterson from Peterson Holistic resigned (they are way busy in their new location!) 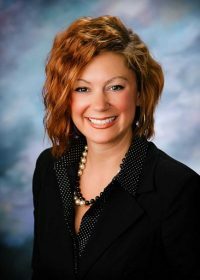 and the Board approved the selection of Randi Willlard the Vice President and Branch Manager of American Trust & Savings Bank. Welcome Randi! We’ll be putting you to work right away! Your Windsor Heights Chamber exists to support our members, our local businesses and organizations through advocacy, publicity, education and economic development. We would LOVE to have you join us. And, you can do that….right here! Thanks for reading and we’ll see you around town!